Washington Gardener Magazine PHOTO CONTEST Kicks Off! The 6th Annual Washington Gardener Magazine Photo Contest kicks off now! 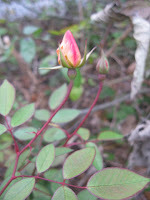 Time to start sorting and picking out your best 2011 garden shots. The entry period is January 1-20, 2012. Note that eligible entries must have been taken in the 2011 calendar year in a garden setting within 150-mile radius of Washington, DC. A Moss Container Garden is a super-easy project and you can do it anytime of year. It is especially a nice garden to create with little ones. They can notice all the different kinds of moss that grows when out on an early winter's walk. Watch this short instructional video and then make it with some moss, found objects, and your imagination. The moss garden can be kept indoors or out. You can take it apart after you have enjoyed it and return the moss to where you found it or add the moss to your own garden. If you make one, please take a photo and share a link to your picture in the comments section. I'd love to see your finished projects. 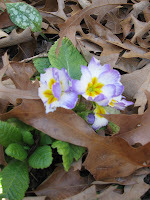 This primrose by my back door has been blooming away since October and shows no signs of stopping anytime soon. 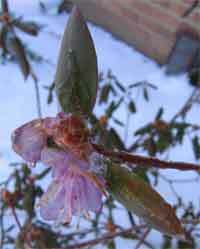 It was downright frosty last night, but that did not stop it. Maybe it is the exceptionally wet autumn we'd had or that it is in a fairly protected spot, I hope it keeps on doing its thing until spring comes. Anything in your garden blooming now that "should not be"? 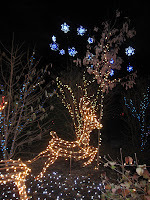 They each won a win a vehicle pass to Brookside Garden’s Garden of Lights Show in Wheaton, MD. The Garden of Lights is a half-mile walk through a landscape of almost a million twinkling colorful lights shaped in imaginative displays throughout the gardens. 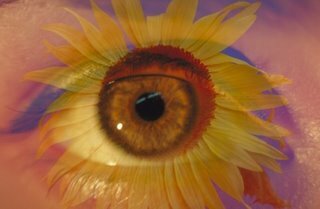 Enjoy the four seasons illuminated as giant summer sunflowers, autumn leaves, winter snowflakes, spring flowers, rain showers, and more. The show runs through Sunday, January 8, 2012 (with the exception of December 24-25 and January 2-5). The hours are 5:30 to 9:00pm, with the last car admitted at 8:30pm. Entry is by car/van and is $20 on Mon-Thurs and $25 on Fri-Sun. It is with great sadness that I post this. I ran into Janet Draper of Smithsonian gardens on Friday morning outside the Downtown DC Holiday Market and she told me of Wolfgang Oehme passing away the day before. I tweeted out the news right away, but could not bring myself to do more until I let the news sink in a bit more. This year seems to have neen especially cruel in our local gardening world. We have lost too many great folks and much gardening knowledge with them. Here is an interview with Wolfgang Oehme from the September/October 2006 issue of Washington Gardener Magazine. You know you’ve “made it” in the horticulture world when you have a plant named after you. Carex muskingumensis ‘Oehme,’ a variegated palm sedge, which was bred from a sport was found in Wolfgang’s garden. I had the privilege of visiting Wolfgang Oehme this summer while on a tour with the American Bamboo Society of area gardens. His home in Towson, MD, is on a large suburban lot off a winding road and suitably the approach gives little hint of what lies beyond. Branches loosely woven together form informal barriers between the planting beds, driveway, and property borders. Rocks are stacked to form impressionistic totem poles and mark the corners of walking paths. His front garden contains many of the bamboos he is a collector of and is so passionate about. A true collector, pots of rare specimens and trial plants fill up his back deck and patio. This co-creator of the “New American Garden” has 43 kinds of grasses and sedges on his property, in addition to 111 ornamental trees and shrubs, 170 kinds of perennials, over 50 fruit and nut trees, and the list goes on. One thing he does not have room for? A turf lawn. His neighbors supply that . Two bodies of water are separated by a tall wall of perennials and grasses. 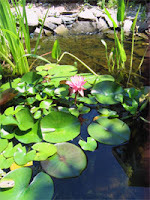 Closer to the house is a naturalized pond complete with croaking frogs. Hidden from view is the pristine lap pool where Oehme gets his regular morning exercise in. Most surprising of all, he has a large edible garden at the back of his property that includes a riot of strawberries, garlic, fennel, figs, and more. Wolfgang himself is generous with his time and knowledge — patiently taking visitors around and naming each plant from memory. 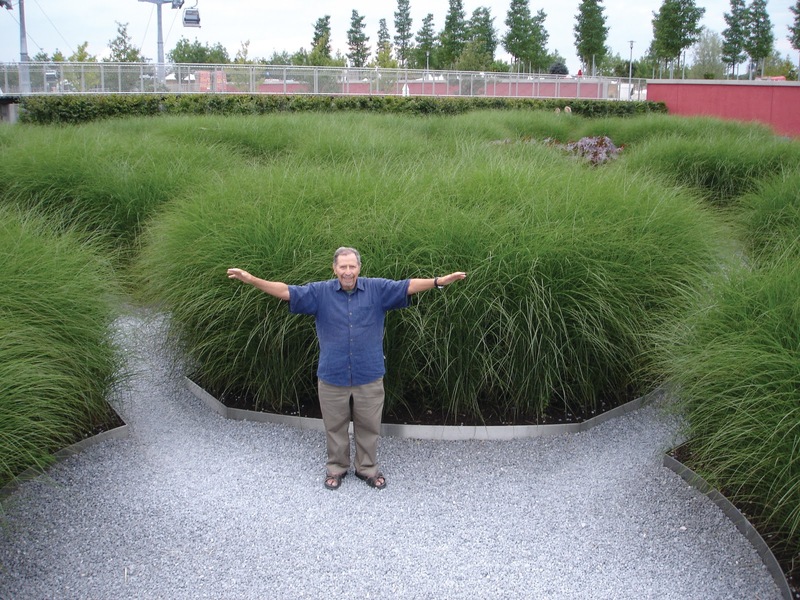 His son, Roland Oehme is also a practicing landscape architect. He specializes in “regenerative designs that enhance the environment and provide active enjoyment for people.” Roland and Wolfgang also host tours to Germany that feature innovative ecological designs. Wolfgang’s landscape firm has given a great gift to downtown Washington, DC, with its bold installations as anyone who travels on downtown Pennsylvania Avenue can readily attest. One pet project of Oehme’s is the Towson Courthouse Garden. Once a flat lawn with a few trees, the land has now been sculpted into an undulating parkland that is the pride of their county. Oehme, van Sweden & Associates, Inc., can be reached at 202.546.7575 or www.ovsla.com. Wolfgang Oehme, co-founder of Oehme, van Sweden & Associates, is a distinguished landscape architect and horticulturist with more than 40 years of professional experience, nationwide and abroad. His career began in Germany, where he completed an apprenticeship at Bitterfeld Horticultural School in 1950 and a degree in landscape architecture at the University of Berlin in 1954. His early work in Europe during the 1950s featured the breadth of experience that marks his work today: from direct involvement with plants (Hamburg’s Planten un Blumen and nurseries in Sweden and England) to large-scale landscape design and land management projects (the Parks Department in Frankfurt and Delius Landscape Architects in Nurnberg). Oehme moved to the United States in 1957. He designed golf courses, parks, and playgrounds for the Baltimore County Department of Parks until 1965, and continued practice independently from 1966 to 1974. His work included park systems for the new town of Columbia, MD, and many private residences in the Baltimore area. In 1977 he founded the firm of Oehme, van Sweden & Associates with James van Sweden. Since then they have collaborated on a full range of landscape design projects, many of which are honored by distinguished awards and published reviews. His credits include redesign of all planting along Pennsylvania Avenue from the U.S. Treasury to the National Gallery in Washington, DC, for the Pennsylvania Avenue Development Corporation; the Virginia Avenue Gardens of the Federal Reserve Board in Washington, DC; Morrill Hall Gardens at the University of Minnesota in Minneapolis; the National Education and Training Center campus for the U.S. Fish and Wildlife Service in Shepherdstown, WV; and the MacArthur Center retail complex in downtown Norfolk, VA. His practice also extends to his native Germany with projects in Chemnitz and Magdeburg. Wolfgang Oehme’s creative use of herbaceous perennials and ornamental grasses demonstrates how dramatic, multi-seasonal, and low-maintenance they can be. His recent honors for this work include the 2002 George Robert White Medal of Honor, awarded to him and Mr. van Sweden, in recognition of efforts to advance interest in horticulture. He is also a co-recipient with Mr. van Sweden of the 1992 Landscape Design Award by the American Horticultural Society, and he holds the Perennial Plant Association’s 1987 Distinguished Service Award for 30 years of active participation. His teaching experience includes the University of Pennsylvania and the University of Georgia. Oehme and van Sweden co-authored Bold Romantic Gardens: The New World Landscapes of Oehme and van Sweden (Acropolis Books, Ltd., 1990; reprinted by Spacemaker Press, 1998). 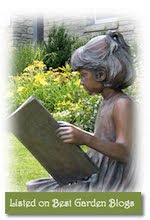 It received two Awards of Excellence by the Garden Writers Association of America. A series of books by Random House also feature the firm’s work. The series includes Architecture in the Garden (2003), Gardening with Water (1995), and Gardening with Nature (1997). Mr. Oehme is a licensed landscape architect and a Fellow of the American Society of Landscape Architects. Peers describe Oehme, van Sweden and Associates’ approach to garden design as the “New American Garden” style. The New American Garden is a metaphor for the American meadow. It reflects the year-round beauty of the natural landscape. It frees plants from forced and artificial forms and allows them to seek a natural course as they weave a tapestry across the entire garden plane. It results in layered masses of foliage that boldly celebrate the ephemeral through mystery, intrigue, and discovery. In sum, it is a basic alternative to the typical American garden scene — more relaxed, less like a formula, and more sympathetic to the environment. Plants chosen for the New American Garden, especially perennials and ornamental grasses, require less maintenance, no deadheading or pesticides, and only limited water and fertilizer. 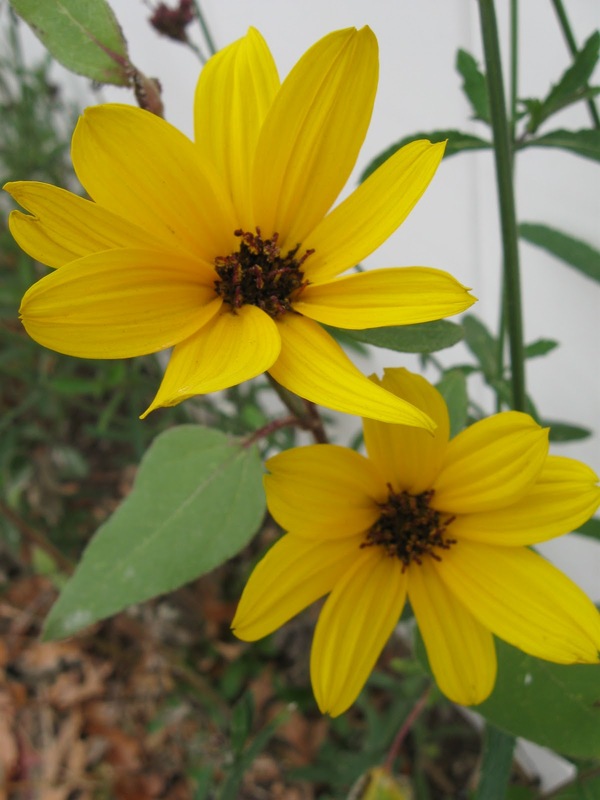 These plants welcome change seasonally and, as they mature, botanically. The built elements of the New American Garden share importance equally with the plants. Carefully designed walls, terraces, steps, and other “hardscape” features complement the surrounding “softscape.” Upon entering a garden, the visitor’s attention is drawn first to dramatic spectacles of planting and then to the practical beauty of built elements that firmly anchor the garden to the ground plane. 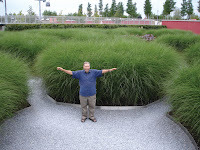 The photo above is Wolfgang with large drifts of Miscanthus sinensis ‘Gracillimus’ at the 2005 Federal Garden Show in Muenchen. © Roland Oehme. 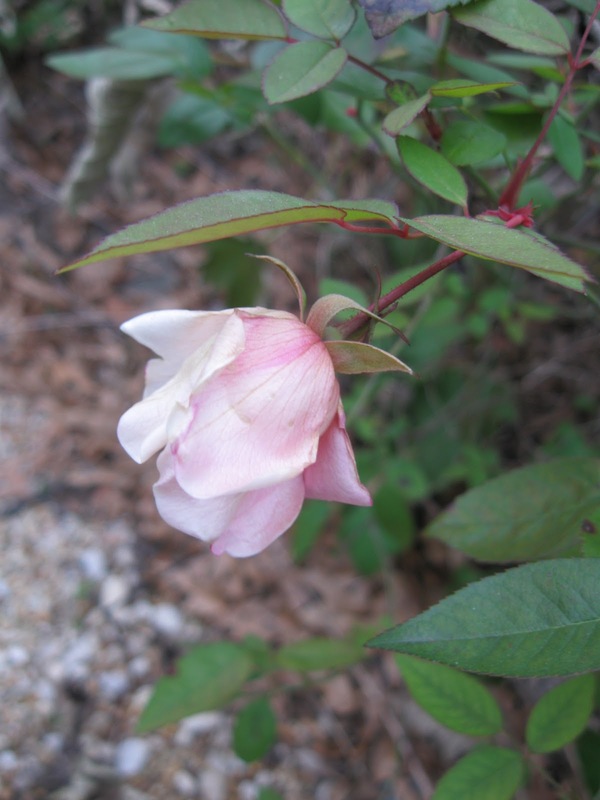 For the December 2011 Garden Bloggers' Bloom Day, I still have a China Rose aka Butterfly Rose aka Rosa 'Mutabilis' in bud and in bloom. Meanwhile my "Christmas Rose" hellebores are just starting to open up just in time for the holiday. 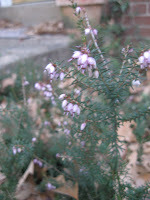 My pink Heathers are blooming the earliest I've ever seen them. It has been a weird weather year in th Mid-Atlantic US states, but I'm not complaining about the relatively mild December we've been having thus far. Another trip into our Washington Gardener Magazine video vaults. This one is a MonkeySee.com production. It is about How to Save Seeds Before Winter. Don't forget about the two upcoming Washington Gardener Magazine Seed Exchanges next January 28 in Maryland and February 4 in Virginia. I'll be posting Seed Exchange registration details in the next week. 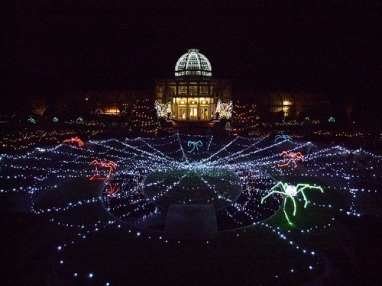 For our December 2011 Washington Gardener Reader Contest, Washington Gardener is giving away passes to the Brookside Gardens’ Garden of Lights Show. 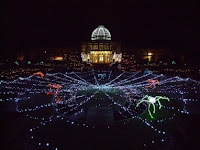 Brookside Gardens’ Garden of Lights is a half-mile walk through a landscape of almost a million twinkling colorful lights shaped in imaginative displays throughout the gardens. Enjoy the four seasons illuminated as giant summer sunflowers, autumn leaves, winter snowflakes, spring flowers, rain showers, and more. 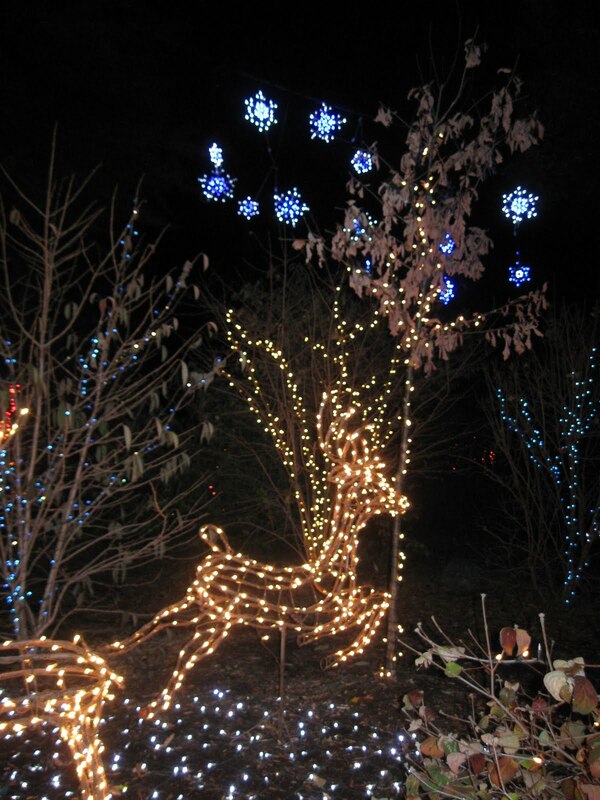 To enter to win a vehicle pass to Brookside’s Garden of Lights Show, send an email to WashingtonGardener@rcn.com by 5:00pm on December 20 with “Brookside Lights” in the subject line and tell us your gardening resolution for the new year. In the body of the email, please also include your full name and mailing address. The pass winners will be announced and notified on December 21. Another trip into our Washington Gardener Magazine video vaults. This one is a MonkeySee.com production. 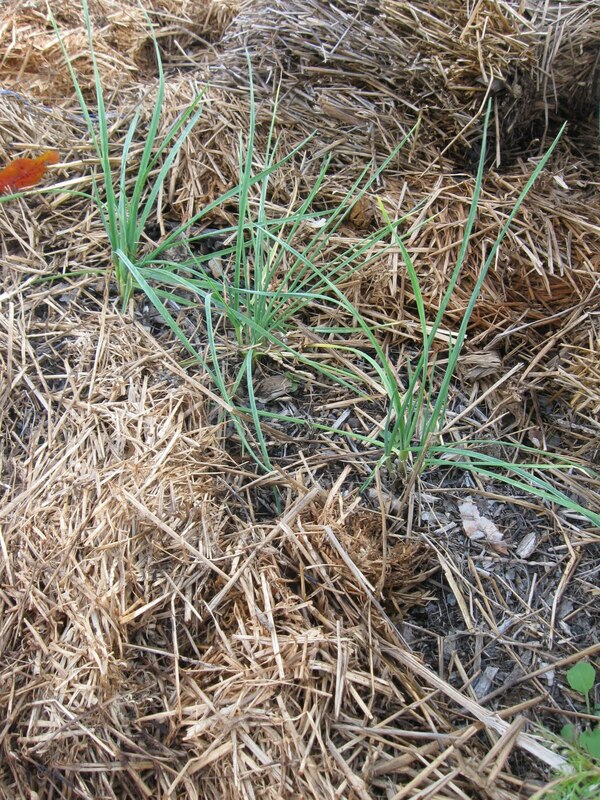 It is about Create a New Garden Bed Without Digging pre-winter for spring planting. Enjoy! 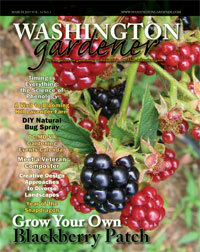 Washington Gardener Magazine will be on sale at the Downtown Holiday Market again this year. 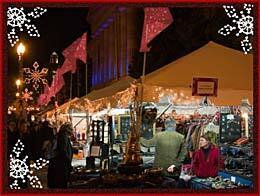 The market runs from December 2-23 and is located on F Street between 7th and 9th Streets, right near the Gallery Place metro. Look for us in the "Jentz Prints" Booth #6. We'll have a display with current and back issues for sale at $5 and subscription cards as well that you can fill out on the spot or take home to mail in later. Generally, the booth will be open 10:00am to 8:00pm each day. I'll be helping out there for several mornings of the market, so stop by and say, "Hi!" Each winner receives passes for two people to the Lewis Ginter Botanical Gardenfest of Lights. I hope our winners will share photos from their visit! We will be announcing our December 2011 Washington Gardener Reader Contest in a few weeks, so be sure to check back at our blog (http://washingtongardener.blogspot.com/) regularly for details. For our October 2011 Washington Gardener Reader Contest, we asked our entrants to tell us if they gardened organically and why or why not those made that choice. Here is what some of our entries told us about their home gardening habits. "I garden organically in my tiny vegetable garden," said Caroline Parr of Fredericksburg, VA."And mostly organically otherwise except for occasional sprays of Round up on recalcitrant weeds. 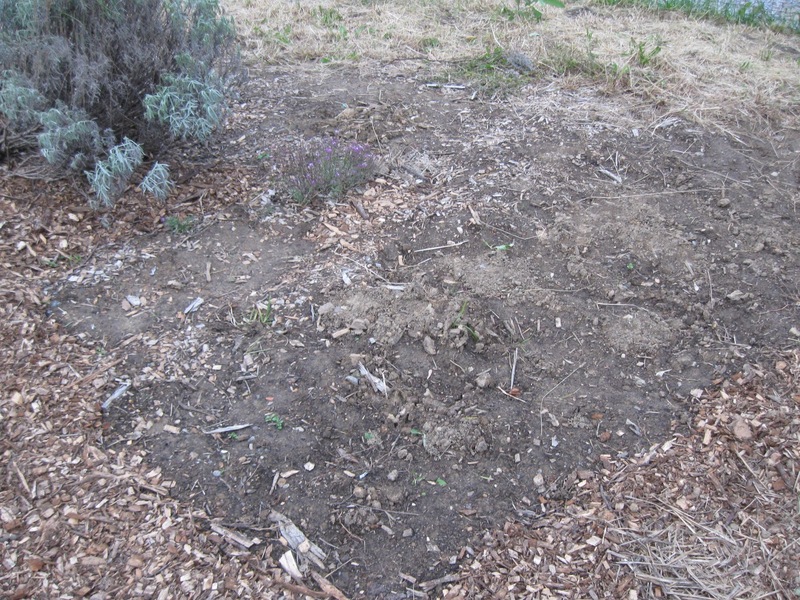 I garden this way due to my parents, who composted everything and gardened happily together for many decades"
"I garden organically because the thought of man-made chemicals poured into my garden confounds me," commented Crystal Nguyen of Westminster, CA. "My garden aspires to be an unsullied haven and sweet blessing to all the bustling creatures who frequent it where, season after season, green happily bursts from the rare virgin ground heinously flanked by concrete and asphalt. It is important to me to give other life forms the opportunity of a more natural existence - of which we are often deprived." 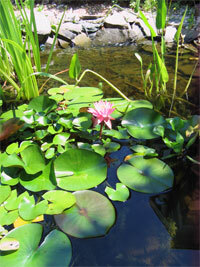 "Our gardening is mostly house plants," explained Ron Horner of Kenosha, WI. "We have had a backyard garden with some fruits and veggies. Need to get back in to that." Tom Mann of Clayton, NC said: "We organically garden for several reasons. 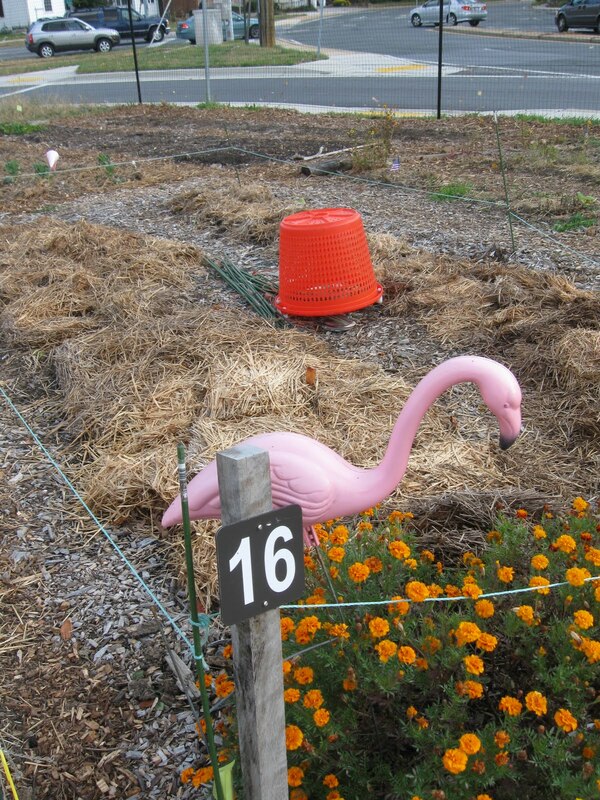 While we're not yet certified, our gardens cater to wildlife. We love our birds and tolerate the occasional deer and rabbits that seem drawn to our yard and gardens, along with squirrels, turtles, and yes, even snakes.. We have a small (8'x10') goldfish pond so we've got to watch out for them as well. Most importantly, our children and their cousins, grandchildren and great nieces/nephew who live close by and are frequent visitors to our little slice of paradise. We want our yard safe for everyone, and everything, and in order to do that, we strive to work the yard as organically as possible, and that includes using Annie's Authentic Haven Brand manure teas for our veggies and flowers." "I do not garden organically but, I’d really like to learn and remove all traces of chemicals from my garden," said Lara Ruiz of La Quinta, CA. "I have experimented a little and find my plants respond better without the harsh chemicals but I did have more aphid issues. I’m an amateur and open to learning how to garden organically for the health of me, my family and my garden." Dale McCarthy of Carl's Watkins Pond Community Garden said: "I'm president of a community garden in the very densely populated community of King Farm in Rockville. 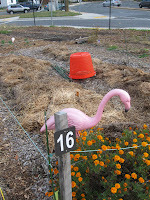 The first plot in our organic garden is for children to learn to grow their own organic vegetables and edible flowers. They learn and practice composting, and we've even tried vermiculture - admittedly with limited success - and we would love to have some organic manure for next year's garden. 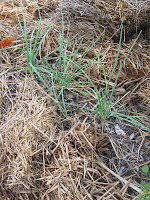 We are about ready to plant our organic garlic the end of this month, and I would be really pleased to let the kids know (ages 5-11) that we have access to this important element to enrich their plots next season." "I try to garden organically--especially for plants that I'll be eating!" explained Kenneth Moore of Washington DC. "Because I grow almost everything in pots, I try to use organic potting soil (trying to grow any edibles in a DC yard's soil is terrifying to me!). I'd love some of the MooPoo to give a little pep to my outdoor plants in the spring!" "Yes! I am an organic gardener, taking full advantage of the mycorrhizae and beneficial bacteria, compost, and mulch in the living soil! " said Geri Laufer of Atlanta, GA.
"I do garden organically as much as possible," said Paige Puckett of Raleigh, NC . "The only exception I make is when fire ants enter the garden. I have a toddler and a preschooler, and I can't risk their sweet little bare feet to ant stings. I've used a variety of fertilizers, but over the years I've moved towards natural sources, compost, and manures. I like being able to munch on arugula while I tend to the garden and not have to worry about chemicals being on the leaves. I'd love to try Moo Poo Tea, as I see people talking about it on their garden blogs and Twitter all the time. Thanks!" Jeavonna L. Chapman of Baltimore, MD said: "I grow organically because it is cheaper, healthier, more environmentally friendly. Did I mention cheaper. I've know about the benefits of manure tea for years, but whipping up a batch was always a pain. This version is so easy. Just drop the packet in a bucket of water and wait three days. I mix it half-an-half. Very satisfied with the results. 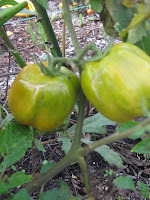 This was a terrible garden year - weeks of 95+ humid rain-free days, Two crazy hurricanes, Irene and Lee. I didn't expect much. I started to pull everything up after Lee, but Annie said keep feeding 'em. They'll be fine. I've got figs, cherry tomatoes and magnolia blossoms in late October. My plants are doing great. Thank you, Annnie and Haven Brand Manure Tea. I like quick, easy and effective. " "I will not say I have an organic garden since I do not always use organic seeds nor organic dirt," explained Faith Hood of Falls Church, VA. "I do my best to keep it as organic as possible. I also try to draw the proper insects. Though, I guess my garden was so good, that it drew more plant-eating insects such as grasshoppers." 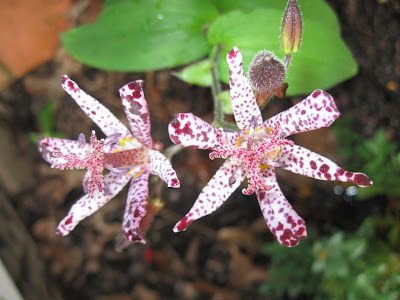 The winner of our October 2011 Washington Gardener Magazine Reader Contest is: Paige Puckett, who was chosen at random from all the submitted entrires. She receives a Sampler Pack of Manure Tea, which includes one each Cow, Horse, and Alfalfa manure tea bags from Authentic Haven Brand (a $13 value). Authentic Haven Brand (http://www.manuretea.com/) offers a full line of all-natural, premium soil conditioner teas for the home gardener, landscaper, and farmer. Haven Brand uses only the highest quality manures from livestock that are raised on permanent, native grass pastures at the Haven Family Ranch. So do YOU garden organically? Why or why not? Frost/freeze warnings last night and snow(!) predicted for this weekend, caused me to run over to my plot at the Fenton Community Garden and see what I could salvage before the cold moved in. I was surprised at how much is still there. 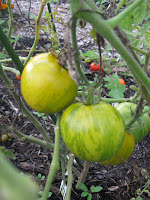 I picked ripe tomatoes, tomatillos, and an eggplant. I also cut down my okra and it is a bit too woody for eating, so I placed them on a screen in my unheated sun room to dry out. I want to save seeds and also use them for craft projects. (Spoiler alert: Everyone is getting an okra Santa ornament for Christmas this year!) 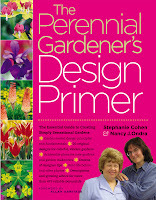 I'll also be sending some up to NY for my crafty, garden writer friend Ellen Spector Platt. She requested some for her dried arrangements. 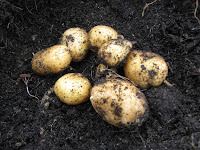 Then I remembered I still had two rows of German Butterball potatoes (three mounds each) that I had not dug up yet. I unearthed one mound and found those gorgeous little tubers. Guess what's for dinner tonight? I'm going to leave the rest in the ground for a bit until I do the full garden clean-out. 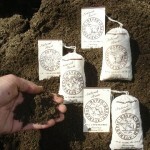 For our October 2011 Washington Gardener Reader Contest, Washington Gardener Magazine is giving away a Sampler Pack of Manure Tea, which includes one each Cow, Horse, and Alfalfa manure tea bags from Authentic Haven Brand (a $13 value). Authentic Haven Brand (http://www.manuretea.com/) offers a full line of all-natural, premium soil conditioner teas for the home gardener, landscaper, and farmer. Haven Brand uses only the highest quality manures from livestock that are raised on permanent, native grass pastures at the Haven Family Ranch. To enter to win Sampler Pack of Manure Tea, send an email with “Manure” in the subject line to WashingtonGardener@rcn.com by 5:00pm on October 30. In the body of the email please include your full name, email, mailing address, and tell us if you garden organically and why or why not*. The sample pack winner will be announced and notified by November 2. 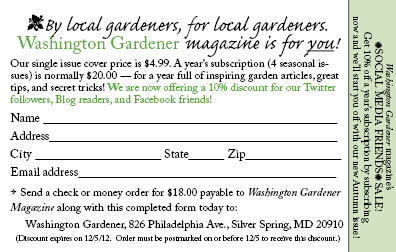 *NOTE: Some of the contest entry responses may be used in future online or print articles by Washington Gardener Magazine. Washington Gardener Magazine (www.WashingtonGardener.com) shows you how to over-winter your coleus plants by taking cuttings from them and rooting them in water. My cat, Santino, was a BIG help filming this one. Because he would get out of the shots, I worked him into the video. I think a star is born! Last week, a bunch of us at Fenton Community Garden gathered and weeded out an unused corner of the fenced-in garden space. It was quick work after all these recent rains. 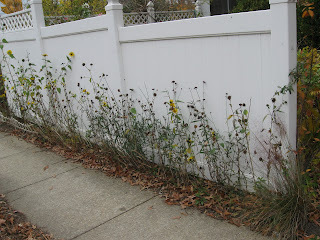 I was shocked to pull up all of weeds with deep taproots like dandelions and Queen Anne's Lace fairly easily. We laid out two large pathways to make access and future weeding just as easy. 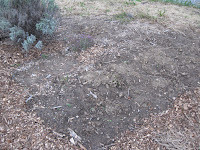 I dug one large lavender (think it is 'Hidcote') from my garden and transplanted it over to start the perennial herb section. Others came in the last week to weed the border and add straw mulch. We'll see next spring about filling out the garden with additional perennial herbs and cutting garden plants. How to Hold a Plant Swap featuring the Takoma Horticultural Club, based in Takoma Park, MD, and the Takoma neighborhood of NW, Washington, DC. ~ Magazine Excerpt: Earwigs - Foe or Friend? I thought I'd take this world-wide Blog Action Day centering on Food to spotlight again the Plant A Row program organized by the Garden Writers Association. As gardeners, we know that the best way to source local, organic food is to grow our own. We also know that sharing that bounty is one of the greatest joys in life. Is your garden’s bounty overflowing? Are your tomato plants groaning with loaded down branches of ripe fruit? Do your neighbors pretend their not home when you come over with yet another bag of zucchini? 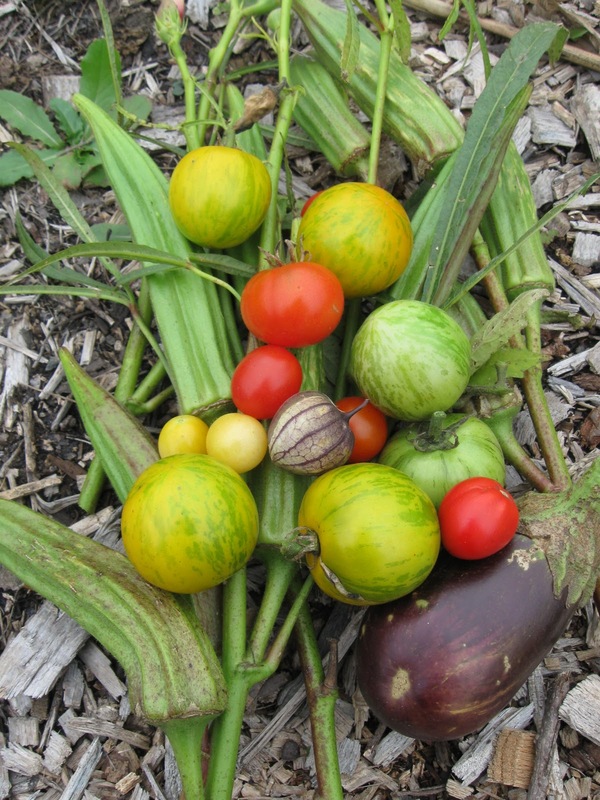 Looking for a place to donate your garden’s bounty? Plant A Row for the Hungry (PAR) is one answer. The concept is simple. There are over 70 million gardeners in the U.S. alone, many of whom plant vegetables and harvest more than they can possibly consume. If every gardener plants one extra row of vegetables and donates their surplus to local food banks and soup kitchens, a significant impact can be made on reducing hunger. Food agencies will have access to fresh produce, funds earmarked for produce can be redirected to other needed items and the hungry of America will have more and better food than is presently available. One in ten households in the United States experiences hunger, according to the U.S, Department of Agriculture. With the current economy, those extra fruits and vegetables from your backyard garden are needed now more than ever. Lowenfels began PAR in his local Alaska garden column, when he asked gardeners to plant a row of vegetables for Bean’s Cafe, an Anchorage soup kitchen. Since then, PAR has grown exponentially through continued media support, individual and company sponsorship, and volunteerism. PAR does all of this without government bureaucracy and red tape -- just one gardener at a time helping their neighbors. Carol Ledbetter, PAR coordinator at the Garden Writers Association, says, “Donating your excess produce is particularly important now... local gardeners’ donations are urgently needed. This is directly helping in our own neighborhoods.” Part of Ledbetter’s mission is to direct gardeners trying to find out where to donate their excess and also working with anyone wishing to start a PAR program in their local area. She can be reached at PAR@gardenwriters.org or 877.492.2727 (toll-free). The Capital Area Food Bank has just launched the Grow A Row project. 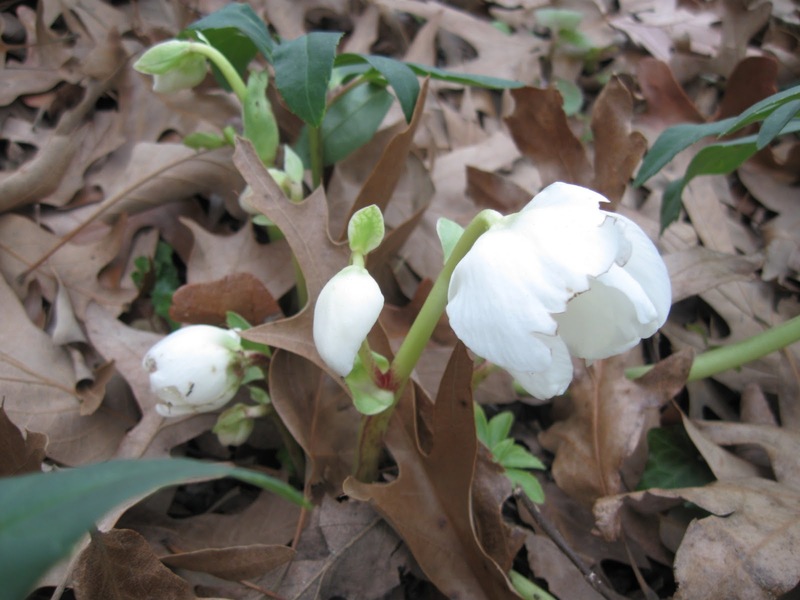 Gardeners throughout the Washington, DC metropolitan area are encouraged to participate. Whether you grow an extra row, dig up your entire yard, or organize a collective donation from your community garden, we appreciate your contribution. Donated produce is provided to Capital Area Food Bank member agencies and local community organizations that have the capacity to use the produce. The Capital Area Food Bank works with a network of over 700 charitable organizations in the DC metro area, including food pantries, soup kitchens, youth programs, and emergency shelters. Contact Anika Roth (202.526.5344 x298 or rotha@cfoodbank.org) to participate and they will work with you to determine the best way to distribute your produce to the community. All participants will receive a Grow A Row Participant sign to put up in their garden and will be recognized on their web site. In Prince William County, VA, the Virginia Cooperative Extension office oversees a volunteer master gardener program which coordinates donations to local food banks. On Thursdays and Saturdays, they do collections at the Manassas Farmers Market. Local gardeners can bring their excess produce to donate and we also collect any unsold produce at the end of the day from the market. This saves the farmers from hauling it back home and stops needless waste. 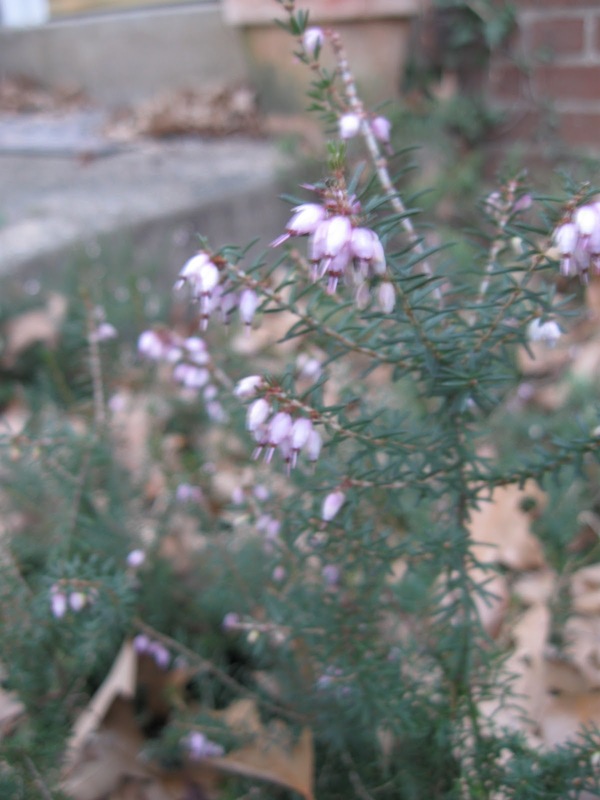 For information on this program, contact the Virginia Master Gardener helpline at 703.792.7747. One little known but highly effective local excess produce donation program is Harvest for the Hungry at the USDA in Beltsville, MD. Between 70,000 – 100,000 pounds of produce (tomatoes, peppers, broccoli, melons, potatoes, sweet corn, squash, etc.) per year is harvested by volunteer groups and given to Food for Others. The USDA tests out hundreds of new plant varieties and at the end of their testing the food would otherwise just go to waste in the fields. Last year, in one weekend, over 200 Girl Scouts toured the Beltsville Agricultural Research Center and then helped pick produce which Food for Others uses for individual food boxes and local DC area food banks. For more information on the program, contact the USDA coordinator at 301.343 8295 or visit: http://www.ars.usda.gov/Services/docs.htm?docid=8803. During this harvest season, before you let your fruits and vegetables go to waste or straight to the compost pile, take a few minutes to pick a few and drop them off at your local area food bank or give them directly to anyone you know in need. The answer to your problem of excess is just a few minutes of extra planning and the satisfaction of giving where it is most needed. 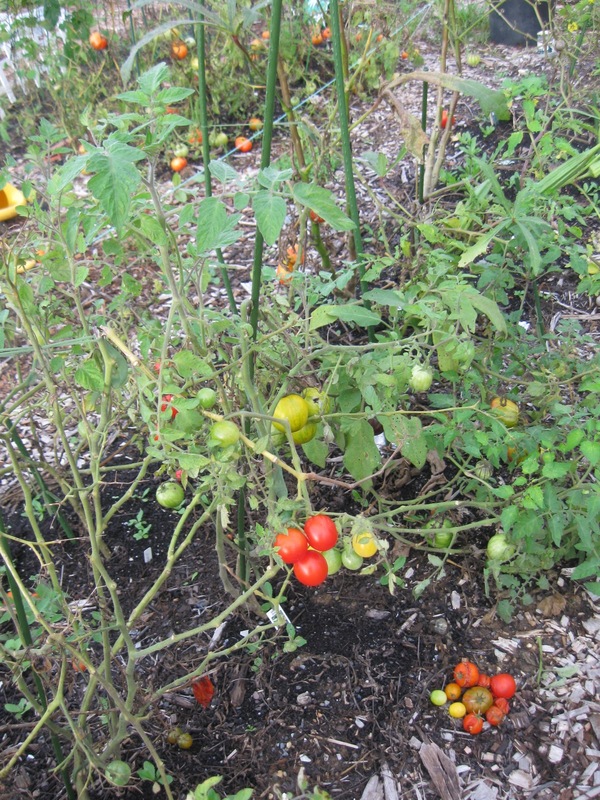 The tomatoes at my Fenton Community Garden plot are still going gang-busters. Not only do I have a lot of fruit, but many plants are still setting blossoms. Here's to an Indian Summer that lasts through December! Thanks to several days this week of torrential rains, I haven't been out to the garden plot much and certainly was not going to put out any seed in these nonstop gully-washers. I plan on starting radish, carrots, and greens once the ground dries out a bit. ﻿ ﻿I was sad to miss the first-ever Harvest Potluck we had in the community garden on Columbus Day. My friend, Angela Erickson Jandrew, passed away and I was attending her memorial service that evening. I have been thinking a great deal about Angela this week when I did get out between rains to my home garden. 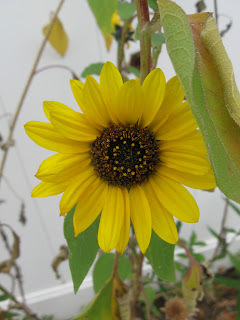 I looked at my fence row of sunflowers in bloom and remembered how much she particularly enjoyed that flower. It matched her sunny personality and I think I'll always think of her when I see them. 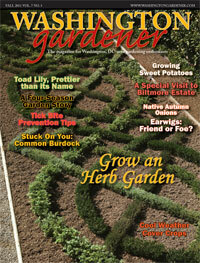 Super-Easy Seed Saving with Washington Gardener Magazine. Here we are demonstrating seed collecting from a variety of flowering plants and herbs including basil, bronze fennel, marigolds, echinacea, and more. ~ Washington Gardener Magazine Seed Exchange at Green Spring Gardens in Alexandria, VA, on Saturday, February 4, 2012. So the corn plants at my Fenton Community Garden plot are done and played out, I'm yanking them out this week. Or rather, I TRIED to yank on them, but found their shallow roots are much stronger than expected, so I'll be digging them out. I'm saving the stalks for Halloween/Thanksgiving decor. 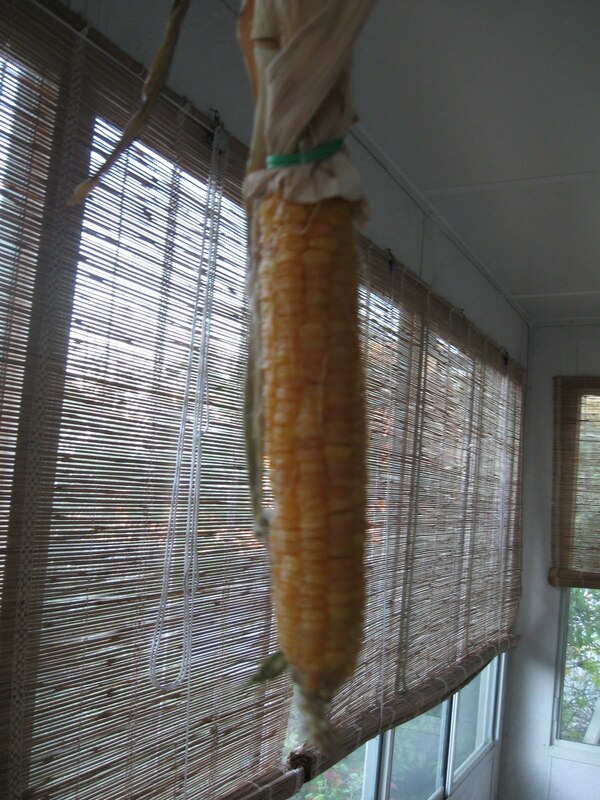 I plucked off the last of the ears and am hanging them in my sunroom to dry out for seed saving. They actually are drying very nicely (see photo) so may go for decor use for a bit as well before I take off the kernels and label/store them for this winter's Washington Gardener Magazine Seed Exchange. This video is of DC Farm to School Week 2011 kick-pff event on 10/3/11. It is Washington, DC's annual week to focus on getting fresh, locally grown food into school lunches. This video features the chef competition, the school garden, and comments from the judges. Enjoy! ~ Katie Rapp of Gaithersburg, MD, said: "Solidago: I love all goldenrods... nothing says early autumn to me like goldenrod catching the sun's rays in the late afternoon. I have a dwarf variety in my yard that I like very much (although the deer do, too)." ~ Madeline Caliendo of Washington, DC, said: "Sedum because it turns a beautiful bronze color in the fall (and it is easy to grow...)." ~ George Graine of Falls Church, VA said: "Nipponanthemum nipponicum (Nippon Daisy). 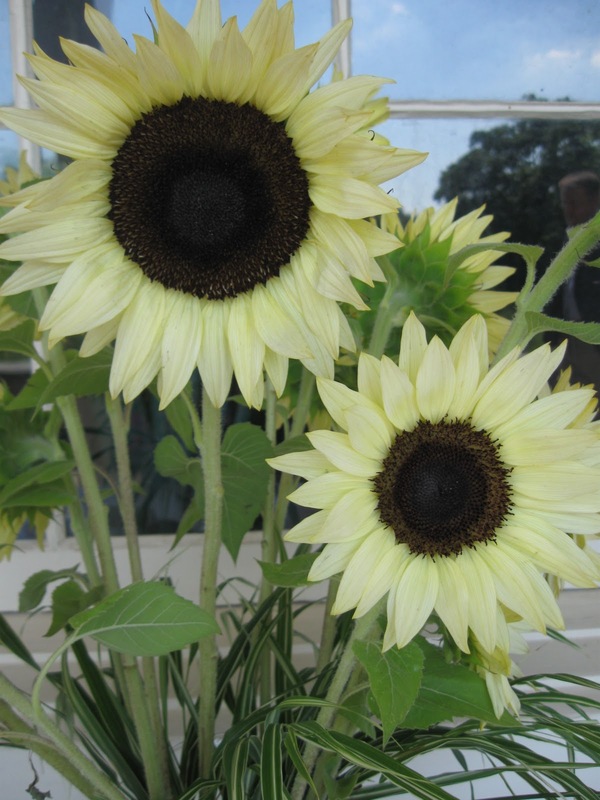 This perennial extends the growing season with daisy-like white flower heads to 2-1/2 " across. The leaves are also different from the usual shasta daisy foliage." ~ Lena Rotenberg of Keedysville, MD, said: "My favorite autumn perennial is Sedum 'Autumn Joy,' when the deer don't get to it... My friend Marney gave me my first few plants and I've since purchased a few more. This year they look gorgeous in my native bed!" Did we leave out YOUR Favorite Autumn Perennials? You can add it in the comments here. 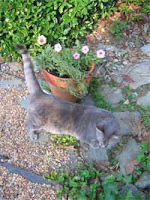 The winner of our September 2011 Washington Gardener Magazine Reader Contest chosen at random from among the submitted entries is: Lena Rotenberg of Keedysville, MD. Congratulations, Lena! 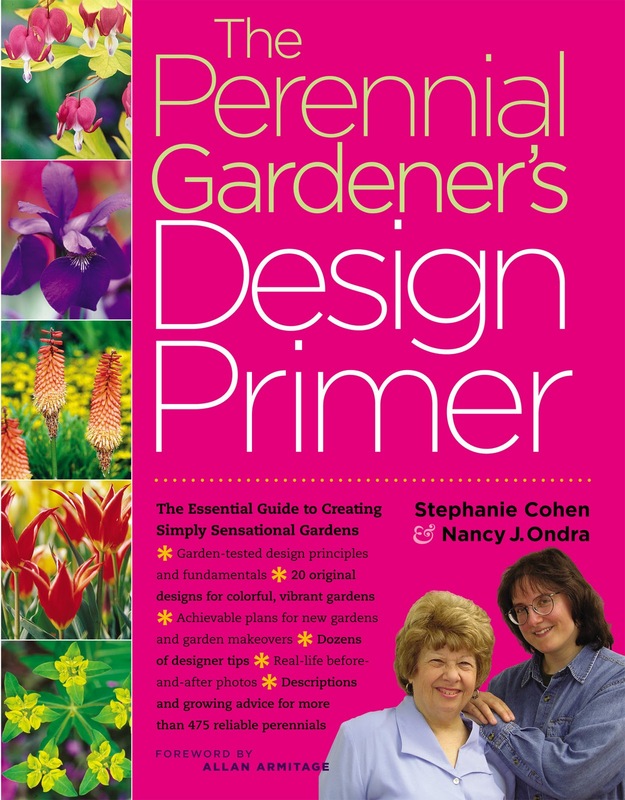 She wins a copy of The Perennial Gardener’s Design Primer by Stephanie Cohen and Nancy Ondra from Storey Publishing (a $25 value). Stephanie Cohen and Nancy Ondra, both Pennsylvania gardeners, are thoroughly obsessed with everything about gardens and gardening — digging, planting, designing, and creating great canvases of living color and texture. Their encouraging words, based on practical experience and the belief that there is more than one right way to create a garden, boost confidence and promote experimentation. Along with design basics, they present 20 garden plans, as well as the before-and-after stories of gardens they’ve created for themselves and their families. 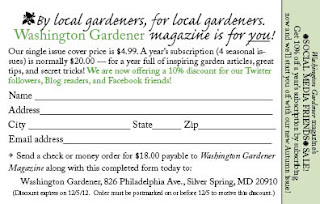 Look out for future monthly Washington Gardener Magazine Reader Contests announced in each issue of Washington Gardener's online newsletter. Fenton Friday -- Tomatillo: Food or Cat Toys? 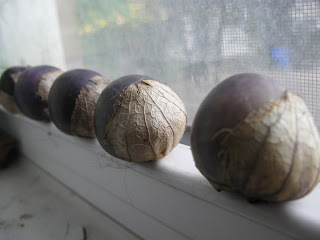 So I have these five purple tomatillos I grew at my Fenton Community Garden plot sitting on my kitchen windowsill. They are pretty and all, but I have NO idea what to do with them. Too few for a salsa or really any recipe. Too tart to just eat them straight. So there they sit. Or should I say, there they MOSTLY sit as every morning this week I have found one or two rolling around on the kitchen floor. Cat toys in some nocturnal kitty soccer game. If you click on the photo to enlarge it, you'll see cat hair on the one that is second from the right as evidence. At this point, I may sacrific them all to the cats unless someone has a good recipe idea? So it started a few weeks ago when a couple friends both separately mentioned wanting to take a NY trip this fall. I remembered I had wanted to take in a Martha Stewart Show taping sometime and figured I'd check the television taping schedule to see if any would make timing sense with the NY trips. On the Martha Stewart web site, the first show listed was for a "Harvest" show and they wanted gardeners to bring in their home-grown edibles. 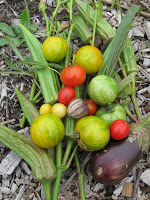 I shot off a quick online note that night describing my new community garden plot and saying I'd bring okra. I got a call and email the next morning say "yes" -- to bring the okra (as no other applicants had mentioned it) and could I bring some gardening friends. I immediately thought of my fellow garden writers and New York natives, Ellen Zachos and Ellen Spector Platt. I called the Ellens and they were both "in." I made my bus reservations and started planning my basket design and wardrobe. The show sent a few more notes asking again for more gardening friends, for garden advice tips, and to tell us all the rules. Those included not to wear black, tan, or grey; to not bring Martha "gift" or expect an autograph; to arrive on time (8:30am for our 10am live show); etc. Packing up my basket the day before my departure, I saw I was a little low on okra so I added a strawberry basket in of tomatillos, yellow cherry tomatoes, and a small jar filled with ground cherries. I then asked a few fellow community gardeners if they had okra to spare. I cut 2 green from one plot and 3 reds from another. I figured more was better than looking skimpy. I'm glad I did as I lost a couple okra somewhere along my journey! The morning of the show, the Ellens and I arrived at the studio to find a long line out front. We had a little time as they brought in groups a few at a time through security and screening. We compared basket contents with our line-neighbors and exchanged stories/backgrounds/introductions. It became clear to me that most others there were not home gardeners, but instead were professional farmers. 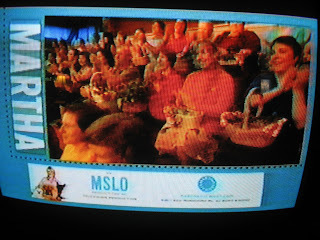 Indeed, as we were grouped and seated for the show, they called folks in by their farm names. I was disappointed that the theme and focus had shifted off of backyard, urban growers, but I understand the staff had to make sure there was a full bounty and good turn-out. While we waited outside, Joey, the warm-up guy, and a few producers came out and told those of us still in line to get ready for a camera pan and to put on our "TV smiles." They did a few passes with a steady cam then we got in and filled out release forms, checked our bags, and got seated. Before the show and during the commercial breaks they played amped-up energy pop like Eminem and the Pussycat Dolls. I had to wonder if Martha actually liked it or merely tolerated it. 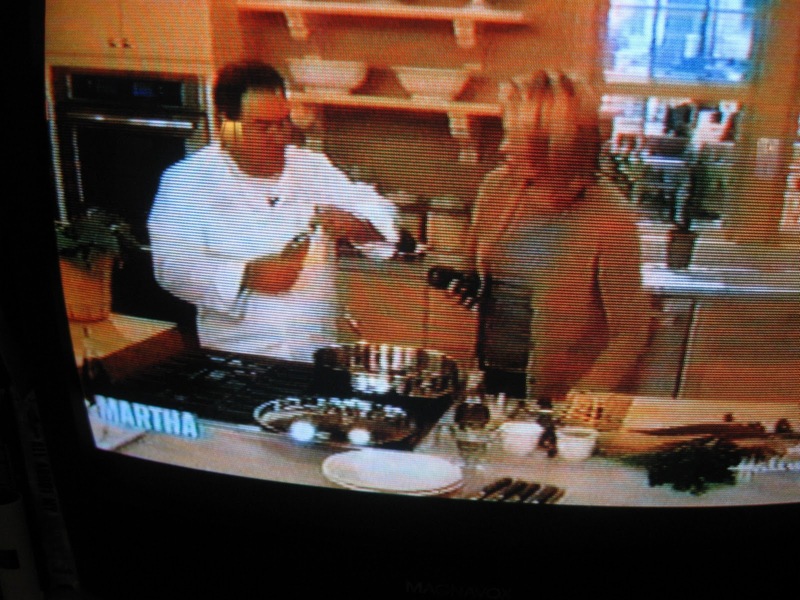 The opening segment, Martha pulled out HER basket of home-grown okra and proceeded to cook with it. So, yeah, my presence or basket were not needed - LOL. It was an interesting show with chef Emeril Lagasse as the only guest. He came in the ground and made a dish from the ingredients he collected from baskets. To me he seemed rather subdued and quiet, maybe Martha makes him nervous? 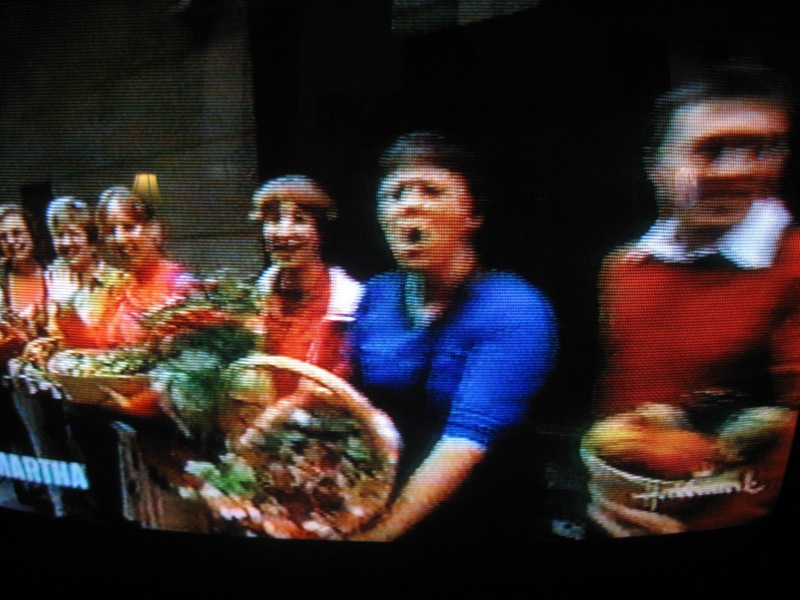 Next, they pulled a NY corn farmer from the audience and he got to use his sweet corn with Martha showing some cooking and preserving tips. 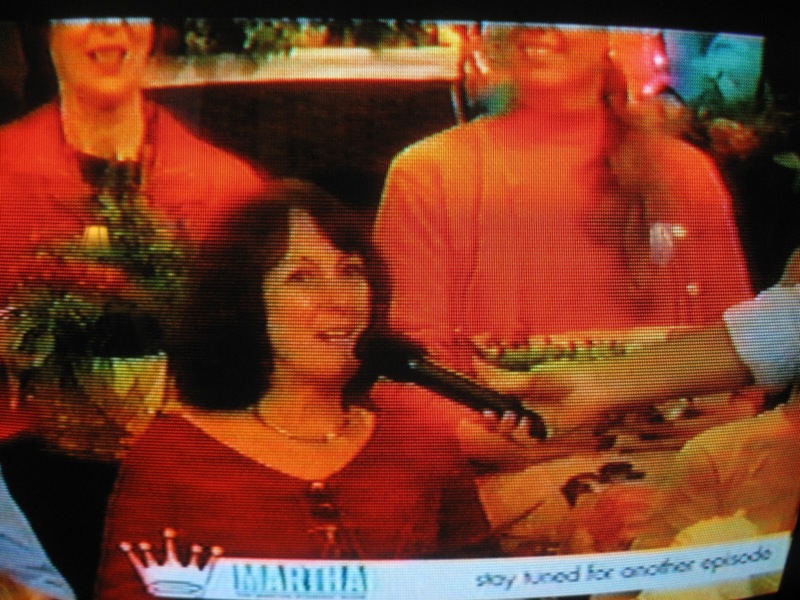 A segment taped at the National Heirloom Exhibition in Sonoma, CA, was very well done, and actually made me want to go to it next year. Though I believe the time conflicts badly with the Heritage Harvest Festival at Monticello :-(. 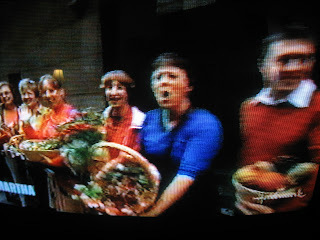 Most of the produce brought to the show went to City Harvest, a NY food bank. 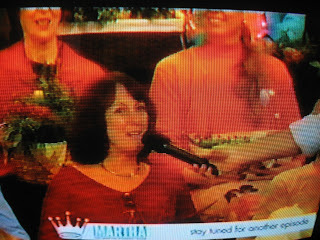 (You were given a choice if you wanted to take it back or donate it and Martha even commented off-camera that she knew it would be hard for some to give-away their home-grown babies as they put so much work into them.) I gave all the okra (about 5 pounds worth), but kept the jar of ground cherries as I promised to try and save the seeds for a few fellow gardeners. The ground cherries and tomatoes I shared with seat neighbors to snack on. After the show, we all received two books, ""Sizzling Skillets and Other One-Pot Wonders," by Emeril Lagasse and "The Heirloom Life Gardener," by Jere and Emilee Gettle. I perused both on the bus ride back to DC. I'll be adding the heirloom edibles book to our review pile for the magazine and think I'll make the Emeril book a prize in a future contest. 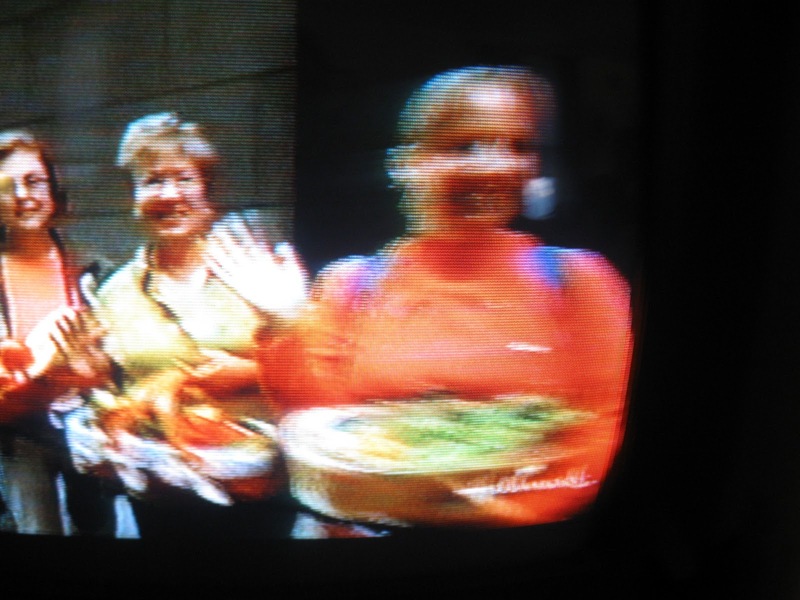 Ellen Zachos in blue, Ellen Spector Platt in red, and me in tangerine sweater set (waving). Don't blink or you'll miss me! 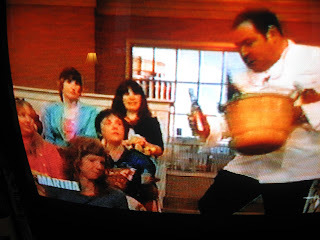 Emeril picks the lilac wine from Ellen's basket. I'm on her left. Emeril trying to open Ellen's lilac wine on air. During the Q&A, the women in front of us gets picked first. You can see Ellen Spector Platt's herb basket on her left and my okra basket to her right. As the end credits roll, they panned up the aisle and you get a really good luck at us and our "tv smiles."